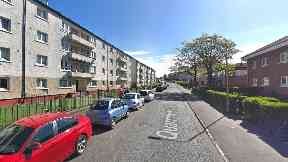 Two men have been arrested following an incident in Glasgow's Quarrywood Road on Friday. A late night fight landed two men in hospital - and then handcuffs. The men, aged 30 and 32, received treatment at separate hospitals following the violent incident in Quarrywood Road, Glasgow, at around 11.45pm on Friday. The pair were then arrested after they were patched up and will appear at the city's sheriff court on Monday. A Police Scotland spokeswoman said: "Around 11.45pm on Friday, January 18, police were called to an altercation on Quarrywood Road, Glasgow. "Emergency services attended and two men, aged 30 and 32, were taken to hospital for treatment. "Both men have been arrested and charged in connection with the incident. "They are due to appear at Glasgow Sheriff Court on Monday. A report will be submitted to the Procurator Fiscal."